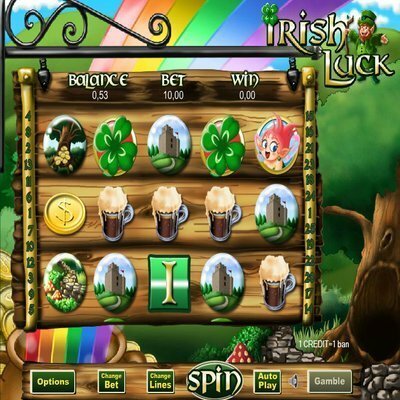 [miau] While the visuals for an Irish Luck Slot machine are tolerably pleasing, lots of greens and whites but avoiding the trap of many others where it spews forth so many sounds and colors as to be a bit maddening, that’s really about all I can put in the positives category for this particular choice of slots. Even playing thirty lines per spin saw sporadic wins at best, and often not enough to even make up the price of that particular spin let alone all the ones that led up to it. You’ll at least be able to tolerate sitting at it watching the nines to kings fly by, the woman’s face and pots of gold – and they will fly by. Through dozens upon dozens of spins I saw precisely one bonus game, picking from pots of gold for a base amount of cash and multipliers. Payout on that was appreciable, but far too far between to make up for the overall loss. It’s not as if one expects a slot machine to be the secret to winning in a casino, if there is indeed ever a secret to winning in these places. The house always wins is a saying for a good reason after all. Slot machines are meant to tempt with rapid fire results of many bets at once with little fuss however, and Irish Luck slots fails to deliver quite enough enticement for the investment. There are certainly worse machines out there to pick from, ones with equally sparse returns and far more unpleasant interfaces than Irish Luck has, but that’s setting the bar pretty low as far as slot machines go. Better to hunt for a more satisfying way to spend your time I would think. Either better slots, or something more interactive than pushing a button and seeing whether or not Fortune favors you this day. It rarely will, but even more seldom so when filtered through the cruel algorithms of Irish Luck’s software. I suppose a summary may be in order after the aimless rambling of my overall discontent. We as people play slot machine to indulge a bit of an addictive thrill, the chance to simply push a button and change our lives for the better. It’s not that it can’t happen to you, it’s that you shouldn’t really expect it to or rely on it to – and you really shouldn’t be trusting to Irish Luck if you are.